Dana Mendonca, Instructional Assistant Autism, teaches students at Rescue Elementary School socialization and word association. EDCOE Administrator Christy Ploszaj, who coordinates these programs, gave a brief overview of the exemplary work that is made possible by dedicated team members and strong partnerships with the Rescue Union School District team. “This program addresses the needs of students with autism at ages preschool through 5th grade in the areas of academics, communications, socialization, and behavior. We use evidence-based practices that teach prerequisite skills necessary for increased access to the learning environment. The staffing formula is one educator to two students to provide the greatest impact on skill development and behavioral intervention. 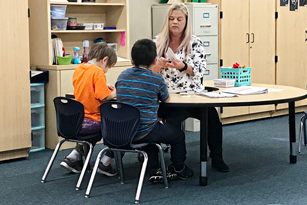 Students integrate into the general education setting with adult support for recesses, lunch, and other activities as appropriate.” A classroom observation showed the CDE representatives the practical application of this framework. At El Dorado High School, EDCOE Director of Student Services, Betty Connolly, joined the group and explained, “This program is a great example of collaboration between EDCOE, the El Dorado Union High School District, and general/special education teachers to help students build skills that will make them successful.” Visitors then entered a classroom alive with energy, as students with moderate to severe disabilities participated in various activities and answered questions through different modalities of learning such as visual, auditory, and kinesthetic. For example, when teacher Jared Parker asked the question “What is the force that pulls a falling glass from a table to the ground?” One student raises her hand and answers, “Gravity!” Another student approaches the illuminated smart board at the front of the classroom and selects the card labeled ‘gravity’ that also pictures an object’s downward motion. This program serves students who have a wide array of disabilities, including autism, intellectual disability, cerebral palsy, visual impairments, deaf and hard of hearing, and orthopedic impairments. The level of support needed for each student varies greatly, and educators work as a team with the El Dorado Union High School District to ensure students receive what they need to succeed. For more information about EDCOE’s programs.